Bob “Dr. 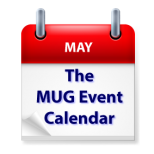 Mac” LeVitus is at the top of the bill on this week’s MUG Event Calendar, followed by a 1Password presentation in Colorado, an examination of Keynote in New Mexico and a seminar on safe computing in Florida. Other topics on this week’s roster include digitizing your media, cord cutting, Dropbox, iCloud, photo editing and more. Triangle Macintosh Users Group – Did 60 Minutes Fudge the Story? Princeton Macintosh Users Group – Tips & Tricks To Make Your Images "Pop"
Main Line Macintosh Users Group – Bill Achuff Tips and Tricks To Make Your Images "Pop"